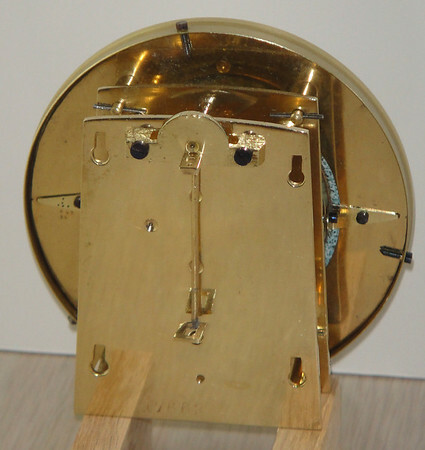 This exquisite miniature Viennese 40 hour (give or take) mechanism reflects the training the Viennese masters received from Swiss watchmakers. It really is a perfect little gem - the dial is only 3.25 inches to the outside of the bezel, the mechanism just 2 by 2.75 inches. And then there are the blue numbers on the dial. These are not just ink, they are fused to the porcelain - baked in when the dial was made. And totally stunning, as are the hands. The spring driven mechanism is typical in the way the spring barrel is mounted to the front plate, what is not typical is the way the click is mounted to the driven gear. Check out the pictures - the click is mounted on a shaft that goes through the gear and is secured on the back side with a taper pin. I love working on these miniature masterpieces!